If the mythical music genre ‘Briticana’ ever takes root then, on the evidence of this new release, Jamie Freeman will be right at the core of the movement. 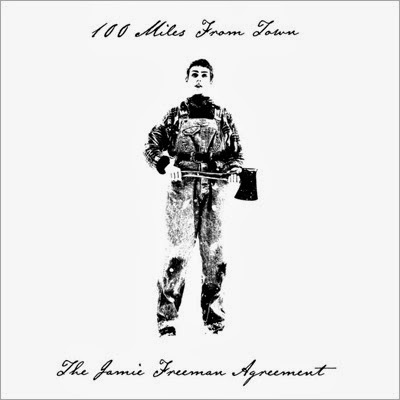 With the help of his band The Agreement and a wealth of guest contributors, Jamie has cut a record that combines a plethora of American music influences, all woven together with a distinct British, if not more specifically English, flavour. 100 MILES FROM TOWN is the second album from Jamie who balances a recording career with running the different strands of the Union Music Store and generally being an Americana music activist. This multi-merited release has the potential to nestle securely amongst the finest of British purveyors of this music style. Diversity is a popular word frequenting the modern day dictionary and over the course of a 43 minute-13 song experience, Jamie fluctuates between folk, country, Americana and rock n’ roll as well as adding a hint of gospel and even a Mod feel to a couple of tracks. The appeal of the record lies within the layers of musical arrangement and song construction, along with Jamie’s ear for a story and the valuable acquisition of additional vocals to help bring the tracks to life. Jamie has certainly utilised the gifts of the many top notch artists that pass through his East Sussex base. The instant effect of one such talent is the lap steel and mandolin playing of the Lovell Sisters, Megan and Rebecca, now more commonly known as Larkin Poe, which soaks into the folk oriented opening song ‘The Knight’. Later in the album, Canadian songbirds The Good Lovelies add a sublime harmony touch to the retro but still relevant rocker ‘Two Sugar Baby’ which even before reading the sleeve notes was recalled as a familiar social media handle. The third and probably most profound interim input comes from highly respected Austin based artist Brandy Zdan who co-wrote with Jamie the album’s standout track ‘Steel Away’. This superb song echoes the vibes from the golden age of west coast country rock and who better to step forward to offer his Pedal Steel services than UK stalwart of this iconic instrument B.J. Cole. To further infiltrate the core of American roots music, Jamie has chosen to promote this album with a classic-styled up tempo Americana murder ballad ‘Hey Hey Indianna’ and reveals his writing ability to pen a serious tale with a catchy hook. For a closer influence to home, Jamie has assembled a fine band under the collective name of The Agreement consisting of regular contributors Abigail Downs, Jessica Spengler, Jonathan Hirsch and Joe Ellis. The two female band members join guest vocalist Rachel Davies and Jamie to deliver the groovin’ almost instrument free gospel-eque moving song ‘Hey Mama’ which you could envisage being a popular live participation number despite it’s quite sad lyrics and true inspiration. More traditional English influence surfaces on the dobro driven ‘Down from London’ while folk figures strongly on the Amy Tudor poem ‘Message from Limbo’, an acoustic effort very reminiscent to the work of Seth Lakeman. One suspects that Jamie may be rolling back the years a little with the guitar rock style used on ‘Scrabble in Afghanistan’ as vivid images of a post-punk new wave band immediately accompany the solos decorating this song, co-written with the previously mentioned Amy Tudor. The best of the rest probably lies within the penultimate track, another groovin’ narrative piece titled ‘Annie Ran Away’. This is in effect the album closer as the 13th and final track is a short piano piece which is intended as a thoughtful response to the previous song. Jamie admits on the sleeve notes that he doesn’t play piano, however this has no adverse impact on the album which is healthily stocked with a wide multi-dimensional offering of string instrumentation. 100 MILES FROM TOWN may indeed turn out to be a rare musical outing for Jamie Freeman but the mileage for appreciation, airplay and live performance has limitless potential. Maybe an early July festival appearance in deepest Suffolk is one possible ideal occasion to hear it live. In the meantime, investment in this album is an enriched activity and will yield little regret.